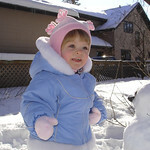 These are photos of our daughter Alison in the month of March, 2007. She is 22-23 months old. Photos are in chronological order, starting at the upper left.